Oil on canvas, 27 x 33 cm. Eckersberg spent the years 1813-1816 in Rome, where he painted a number of architecture studies, in which he, as he himself explained, prioritised precision, colour, forms and lines. 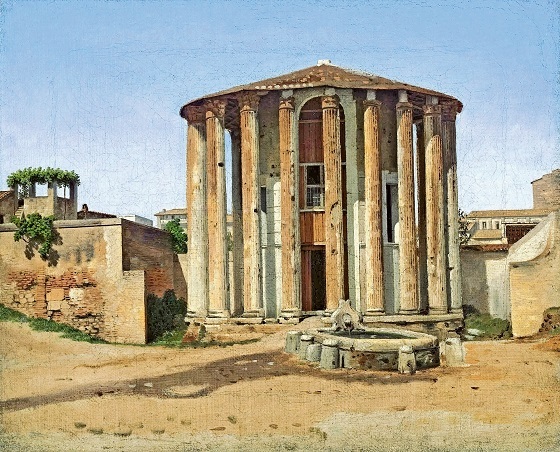 Here, Eckersberg has painted a small, antique circular temple at the Tiber River. The temple still exists today and is among the most well preserved in Rome, but the area around the building has today been rebuilt into a large square. Eckersberg was fascinated by the monument’s simple, geometrical design and the possibility to study it according to the principles of perspective. His choice of an antique circular temple as his subject was completely in line with the time’s enthusiasm for Antiquity. There are no figures depicted and the overall expression appears as a mixture of static and light flickering in the bright, clear sunlight.